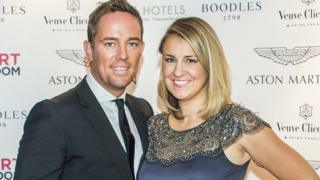 The wife of Sky Sports anchor and ex-Blue Peter presenter Simon Thomas has died, just three days after she was diagnosed with acute myeloid leukaemia. Thomas tweeted that he was “crushed with indescribable pain” following the death of his 40-year-old wife, Gemma. He said she died “surrounded by her family and friends” and that their son Ethan, eight, was “in bits”. Thomas presented Blue Peter for six years and left for Sky Sports in 2005. Today I am crushed with indescribable pain. Just three days after falling ill with Acute Myloid Leukaemia, my dear wife Gemma passed away yesterday evening surrounded by her family and friends. If you are a prayer – pray for my boy Ethan. 8yrs, precious and in bits. Thank you. “Today I am crushed with indescribable pain,” he said in the post. “Just three days after falling ill with Acute Myloid Leukaemia, my dear wife Gemma passed away yesterday evening surrounded by her family and friends. Footballers, including England striker Jamie Vardy and England women’s captain Steph Houghton, also tweeted their sympathy. Norwich City Football Club – the team Thomas supports – said the thoughts of everybody at the club were with the presenter and his family. Simon, the thoughts of everybody at Norwich City are with yourself, Ethan and everyone else who knew and loved Gemma at this sad time. Mr Thomas has presented live Premier League coverage for Sky Sports and has worked as a Sky Sports News anchor. About 3,100 people a year in the UK are diagnosed with acute myeloid leukaemia – a type of blood cancer.